On March 19, 2016, Button Masala held an exclusive workshop “"Make an Innovative Garment with Zero Stitching" at ISDI Parsons Mumbai Campus, Mumbai. The facilitator, Anuj Sharma, explained its joinery concept- multiple use of the same product. This concept was based on simple grid system, which gives the wearer thousands of changing possibilities. The alumnus of NID and owner of Button Masala, Anuj Sharma, elucidated that the improved Button Masala made the use of rubber-bands and buttons. Students were captivated by the production process that involves no machine or tool and therefore, even now is one of the most sustainable products in apparel category. Button Masala is one of the fastest production systems at this point of time with marginal overheads. 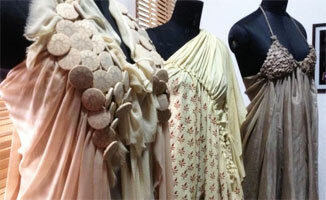 As a concept, it can be learnt by anyone and used to make their own clothes or other products from one piece of fabric.